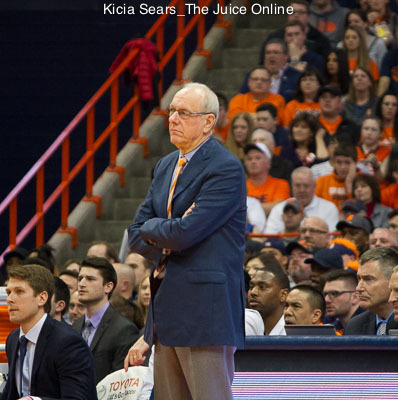 Item: It will be interesting to see just where Syracuse is selected in the Atlantic Division when the annual pre-season poll is released next week, along with the preseason all-ACC team. The results will be released following the annual two day football kickoff event being held Thursday and Friday in downtown Charlotte. When the Atlantic Division contingents meet the media Thursday, there’s no doubt head coach Dino Babers, quarterback Eric Dungey and linebacker Zaire Franklin (making a conference record third appearance at the summertime event) will be asked often about the ongoing process of turning the program around, and in the long run turning the Dome back into the loud and crazy home field advantage that served it well in the now distant glory seasons of the past 30 years. 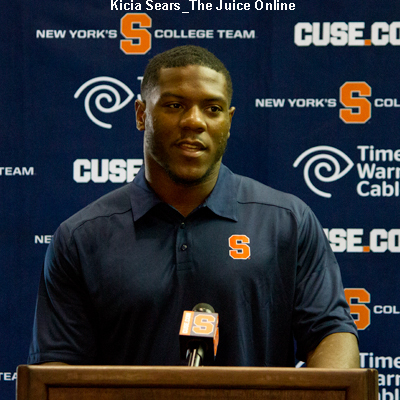 As pointed out by SU media relations, the Orange returns a nation-leading 20 starters from last season. How far will that game experience go in determining how many more wins the team can add to last year’s total of four? 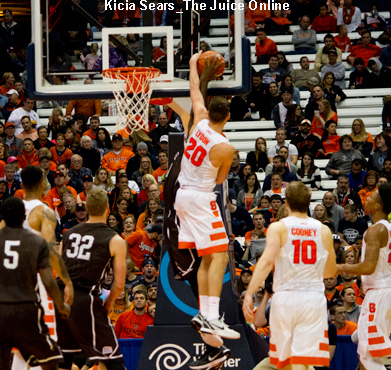 After failing to do so in his first two seasons, will Eric Dungey make it through an entire season without missing a game? How will Dungey feel the week of the Central Michigan game (Sept. 16) with this return visit by a Chippewas defense from the 2015 season, and specifically junior defensive lineman Mitch Stanitzek, who’s brutal helmet-to-helmet hit on Dungey resulted in his ejection in SU’s eventual 30-27 OT win? Assuming injuries aren’t overwhelming, and that’s a hard assumption to make for a program still adding much-needed ACC-caliber depth in its recruiting cycles, could the Orange win six of the seven home games (Clemson) and qualify for a bowl without winning a road game? That’s wins over Central Connecticut, Middle Tennessee, Central Michigan, Pittsburgh, Wake Forest and Boston College. Doable, or somewhat of a stretch? How close will Babers day-one prediction that his offense will start to hit its stride “somewhere between games four and six” of his second season come to fruition? Games four, five and six? How about at LSU, at North Carolina State, and host Pitt (76-61 loss a year ago) in successive weeks? Ouch. Is there a better college football bargain than face value pricing for SU home games? Tickets went on sale this week to see defending national champion Clemson (Friday night, Oct. 13th) starting at $45. A boisterous home crowd would certainly help in the Wake, BC and Pitt games. Will the new policy prohibiting fans from re-entering the Dome once they have had their ticket scanned have any noticeable change on attendance figures and the volume and tone of public reaction? As part of the university’s tobacco-free campus initiative, the policy has now been extended to cover the area around the Dome as with other campus buildings. Fans attending home games who wish to smoke will have to do so before they enter or after leaving the stadium, and not on university property. At age 38, the Dome was one of the last major sports/entertainment venues in which spectators were allowed to re-enter the facility, and SU is now consistent with ACC policy prohibiting re-entry.